I love winter, I really do. One of the things I really love about it is sitting inside cooking and watching the snow outdoors. If you’re like me, you love creating comfort foods that help to ward off those winter blues. 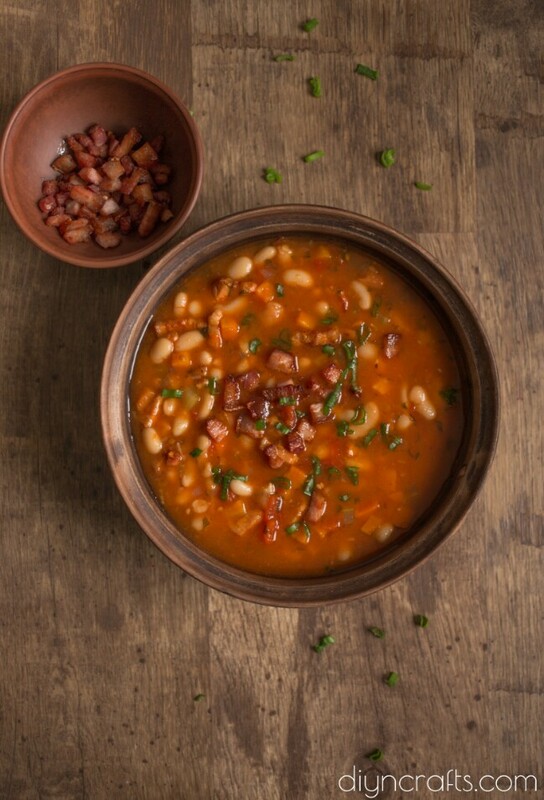 Bean and bacon soup is a staple dish that dates back for decades. I remember my mother making this dish so many times when I was growing up, and it continues to be one of my all-time favorite dishes. Living in the south, we eat a lot of pinto beans. 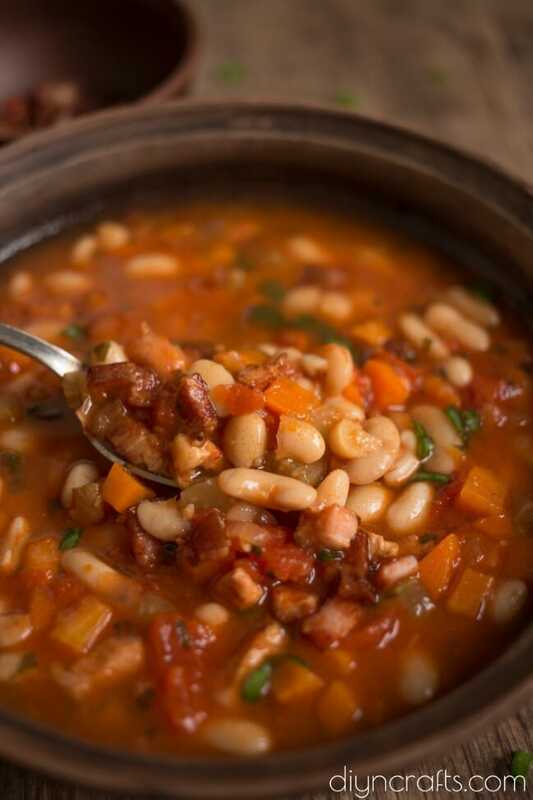 However, white beans are my favorite and this recipe uses white beans, along with bacon, to create an amazing, warming dish that even your children are sure to love. The beans soak overnight which helps to make them cook faster. You only have to cook the dish for about an hour and a half. It’s a great dish to have simmering in the background while you clean house or play with the kids during snowy days. 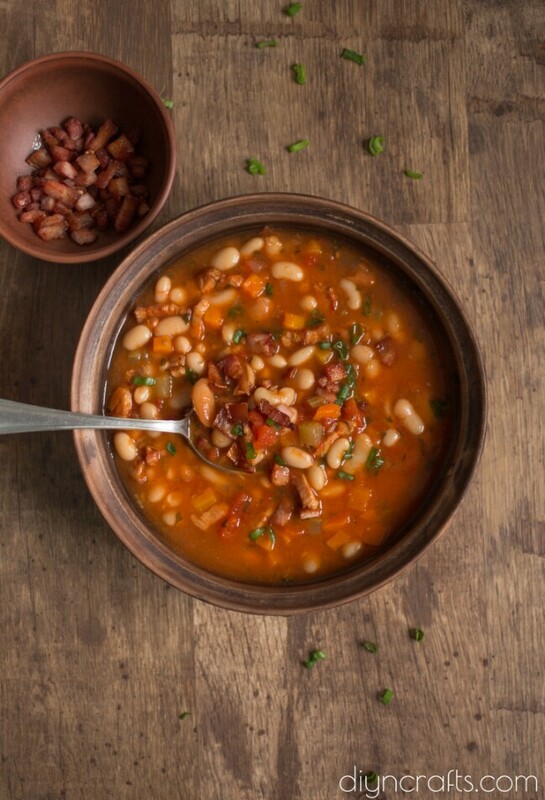 With carrots, celery, tomatoes, white beans, and bacon, this dish is sure to hit the spot on those cold evenings. It’s really simple to make, once you get the preparation finished, and goes wonderful with cornbread or homemade buttermilk biscuits. It’s also a great dish for next day leftovers, so be sure to fix a big pot and enjoy for lunch the following day! 1. Cover dried beans with water and leave to soak overnight. Drain and rinse the beans, add chicken stock and bring to boil over high heat. Lower the heat after boiling and leave to simmer. 2. Cut and brown the bacon, remove onto a paper towels lined plate. 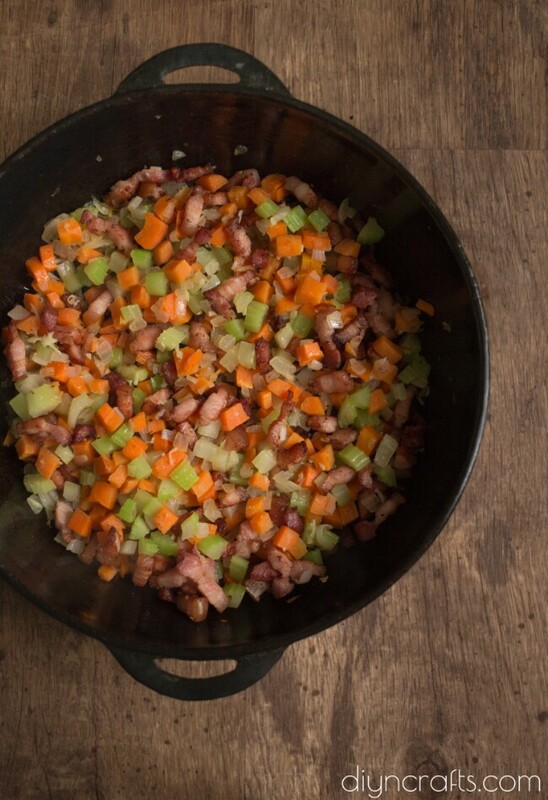 Use about 1 tbsp of excess bacon grease to sauté diced vegetables until just beginning to soften. 3. Add vegetables to the beans with crushed tomatoes, minced garlic, tomato juice, paste and dried herbs. 4. Cover and cook on low for 1 ½ hours. Mix with fried bacon before serving. This colorful soup has so many delicious and nutritious ingredients! 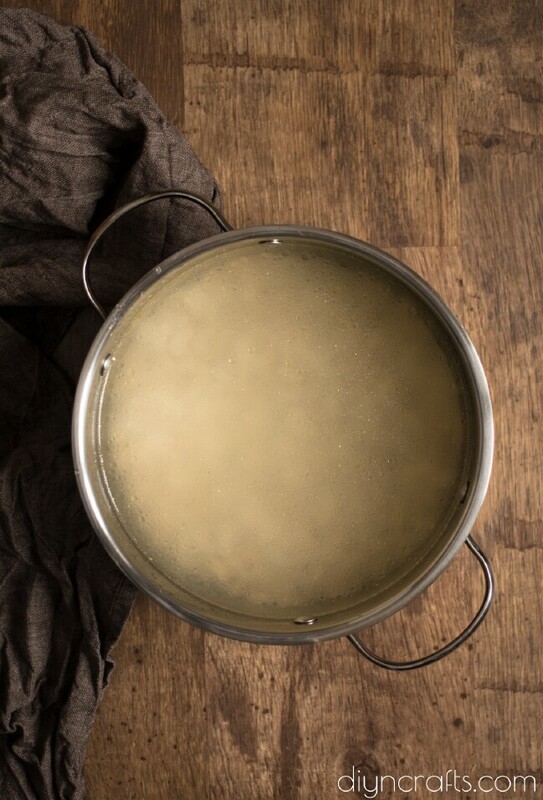 Rinsing beans and allowing them to soak overnight helps to cook them faster. It’s such a pretty dish when you put all the ingredients together. 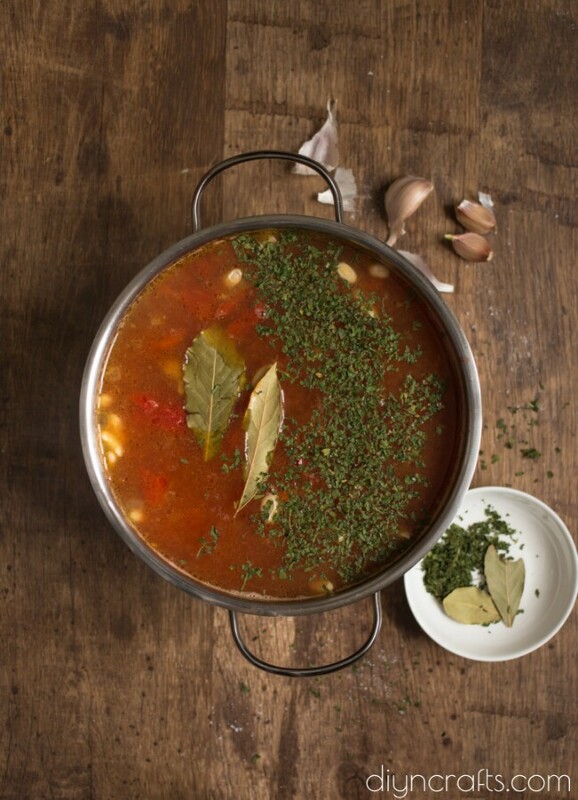 Dried parsley and bay leaves give the soup a wonderful flavor. Add bacon before serving and enjoy! Cover dried beans with water and leave to soak overnight. Drain and rinse the beans, add chicken stock, and bring to boil over high heat. Lower the heat after boiling and leave to simmer. Cut and brown the bacon, remove from heat and place onto a paper towel lined plate to drain grease. Use about 1 tbsp. of excess bacon grease to sauté diced vegetables until just beginning to soften. 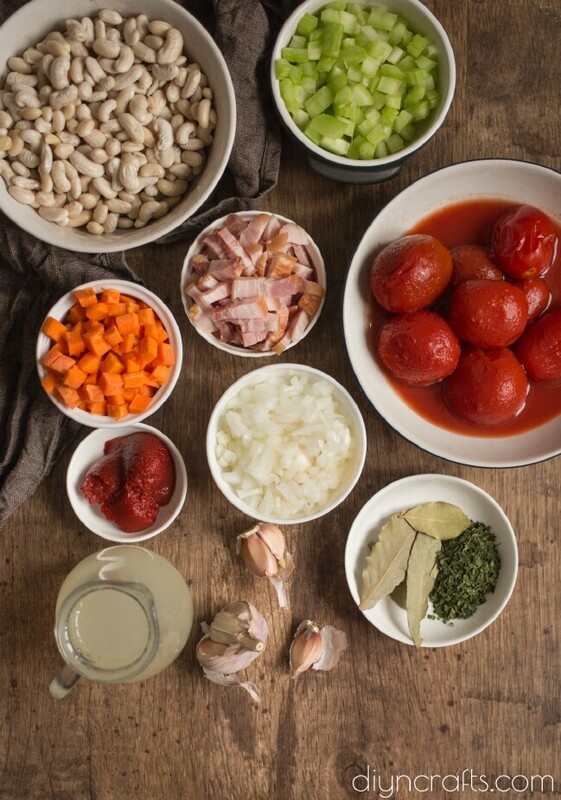 Add vegetables to the beans with crushed tomatoes, minced garlic, tomato juice, paste, and dried herbs. Cover and cook on low for 1 ½ hours. Mix with fried bacon before serving.